Please visit our facebook page for the current information. In 1986, thirteen tightly-knit jazz musicians playing big band music from the late 1920’s and the early 1930’s, emerged from the famous swedish university student orchestras. A foundation was created for an old style big band, and the band, BasKlas And His Ten Doctors of Syncopation was born. 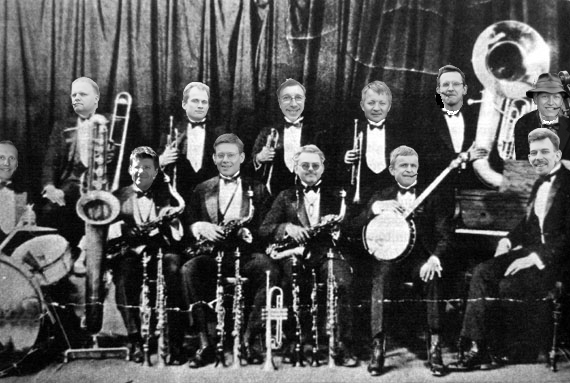 The music style of the early big bands, together with the ”happy touch” from the university orchestras, merged into a unique music mix. Since then, the band has performed successfully time after time, leaving neither the hands nor the feet of the audience still or silent. The top priority for the band is to convey the happiness of the their music style to the audience, creating a party atmosphere wherever it perform. Main focus is the, often very fast, "stomps" from that could be heared in american jazz clubs during the prohibition around 1927. The band has classified the music as "Machine Gun Jazz". Many arrangements are transcriptions from bands and band leaders like Fletcher Henderson, creator of the big band sound, Duke Ellington, Don Redman, Cab Calloway and Fats Waller. The band was formed in 1986 in Stockholm, Sweden. Among continuous jobs, the band has gone on different tours in Europe. The tours are the highlights of the band’s history. The band’s first tour took them to Holland in 1989, with a one-week job at the well-known Nijmegen marches. The band went on to Scotland in 1991, leaving the pubs in havoc and the audiences in obsession. In 1992, the tour went to St Petersburg, Russia, where the band attracted the Russian television and was recorded and transmitted throughout Russia. In 1993, the band performed at the Lysekil Jazz Festival, which is one of Sweden’s main Jazz events on the Swedish west coast. In 1994, Hungary became the target for the annual tour playing at the Miskolc Jazz Festival. In 1995, the band went on to play at the Dillenburg Jazz Festival in Germany, and it is no exaggeration to say that they won the hearts of the jazz connaisseurs. In 1998 the band headed for France to play at the "Oeuf de Jazz" festival in Le Mans, and in 1999 the band appeared in Prague, the capital of the Czech Republic. There the band performed for astonished and enthusiastic audiences in places like, for example, the well-known music pub "Baracnicka Rychta" and the classic old jazz club "Malostranska Beseda". In the summer of 2000 the band for the first time appeared outside Europe. The scene for this year's traditional tour abroad was quite spectacular: Greenland, the world's largest island and a part of the American continent. On this huge and cold northern island, where most of the land is covered by an eternal ice cap, the band was warmly received by the listeners and found great joy in delivering some really hot jazz. This was done in varying environments. The band performed both in the elegant restaurant of the leading hotel in Nuuk, Greenland's capital, in Nuuk pubs and in the little Inuit village of Kapisillit with only around 120 inhabitants. Ice, fjords, whales, mountains and hot nights - a trip to remember with pleasure! The next international appearance took place in September 2001, when the BKAHTDOS band made a short but intense trip to Italy. The programme included outdoor performances in Rome, the eternal city, and in Genzano di Roma, a most picturesque little old town in the Roman countryside. However, the highlights of this trip were undoubtly the two nights when the band played for happy guests at a crowded "Il posto delle fragole". This centre for culture, with a bar and a restaurant, is run by the Scandinavian cultural association in Rome, and here the public and the staff received the band with a warmth and a hospitality that was extraordinary. Thank you! It is also worth mentioning that guest of honour during one of the nights at "Il posto delle fragole" was Anita Ekberg, prominent Swedish former international moviestar living in Italy since many years, who was about to celebrate her 70th birthday. In spring 2003 BKAHTDOS made a short tour to London to do a 2 day workshop in Windsor under the leadership of Keith Nichols. This was followd by a concert on the Swedish embassy in London. In november 2004 the band made a tribute concert to Coleman Hawkins, celebrating the legendary saxophonist 100 year birthdate. This concert was starring the dutch saxophonist Robert Veen playing original arrangements and solos by Hawkins and also bass saxophonist Frans Sjöström who met Hawkins in person. The band made two recordings in spring 2005, with great help of Gert Palmcrantz, that resultet in a record "Screaming Jazz" available upon request for 10 €. In june 2006 the band was the main arranger of a concert (Pajazz) with bands representing the early bigband jazz. Bands present where Rydskogens Joymakers, Southern Syncopators, Kustbandet, Jazzin Topzies (and of course BKAHTDOS). BKAHTDOS also participated in the Swedish traditional jazz music contest of 2007 and won the two finals in Stockholm and ended third in the final. The band was invited to Whitley Bay Jazz festival in july 2009 where it made several apreciated concerts. In august 2011 was the band invited to the largest classic jazz festival in Sweden Hellevik tradjazzfestival with more than 20 000 visitors. 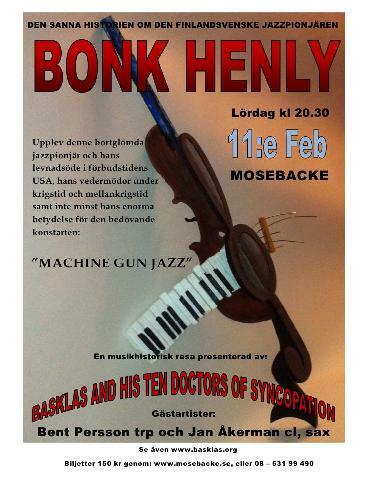 In february BKAHTDOS proudly presented "Bonk Henly - Nordic jazzpioneer, a musical journey with Basklas And His Ten Doctors of Syncopation and Guests" at Mosebacke, Stockholm. This event was a concert tribute to the not so well known Finish musician with relations to Bonk Industries. Apart from regular perfomances at the standard jazz scenes in Stockholm such as Nalen and Stampen, the band plays at weddings, funerals or any other occation of your choice. Please contact Basklas for more information.